Recent research in neuroimaging has been focusing on assessing associations between genetic variants measured on a genomewide scale and brain imaging phenotypes. Many publications in the area use massively univariate analyses on a genomewide basis for finding single nucleotide polymorphisms that influence brain structure. In this work, we propose using various dimensionalityreduction methods on both brain MRI scans and genomic data, motivated by the Alzheimer’s Disease Neuroimaging Initiative (ADNI) study. We also consider a new multiple testing adjustments inspired from the idea of local false discovery rate of Efron and others (2001). 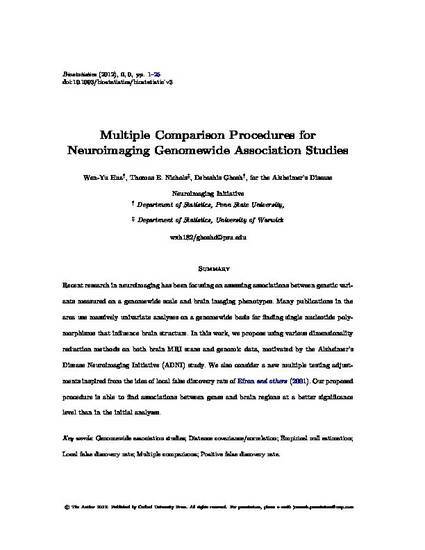 Our proposed procedure is able to find associations between genes and brain regions at a better significance level than in the initial analyses. This is an earlier version of the paper; the final one appears in Biostatistics.